How do I enter my beginning inventory? Yay! What a great decision you have made! 1.) Click the "Inventory" button 2.) Click "Adjustments." Change the "Adjustment Type" label on the drop down menu to "Initial Count." Complete the "Description" field with your desired description. I typed "Beginning Inventory"
Choose the correct date and click "Save"
4.) Last, don't forget to click "Apply Adjustment." YOU DID IT!!! Your inventory is all set up and ready to go. 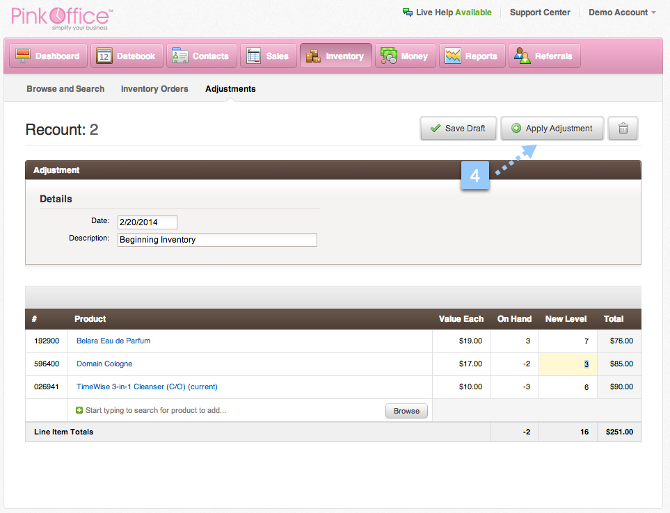 In the future you can save tons of time by importing your orders right from Intouch!